Most hobbyists don’t realize that they have a choice in diode technology. The aquarium lighting market is bombarded with fixtures that only feature diodes manufactured by Cree; as they were one of the first manufacturers to make diodes for reef aquarium usage. While proven to keep coral, diodes from Cree have low PAR:PUR ratios, a limited spectral profile, color rendering that leaves many hobbyists unsatisfied, and a less than stellar track record with other photosynthetic invertebrates such as clams and anemones. This should come as no surprise for those in the know – Cree is an incredibly large LED manufacturer and the aquarium market is too small of a market for such a large company to develop for, as a rule. In this post I’d like to talk about why our Power LED is superior to any other diode on the market, and then provide third party testing data to prove the points made. The above independently generated full-fixture spectrograph of our PR-25UV pendant illustrates why our diode is superior for lighting photosynthetic invertebrates. 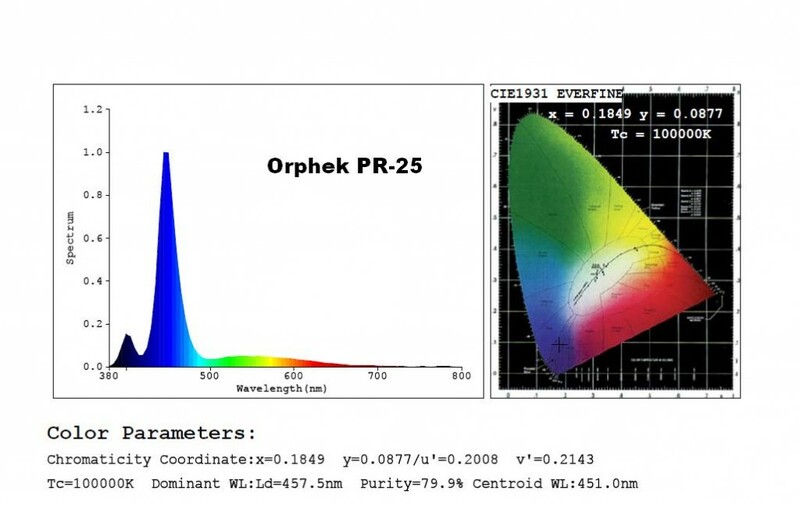 The full spectral profile emitted (400nm to 760nm) means improved color rendering: truly broad spectrum comes superior color rendition, in addition to happier invertebrates. Although the somewhat outdated measurement CRI (color rendering index) is similar between the Power LED and Cree’s X series, CRI is an inadequate way to compare color rendition in the home aquarium, due to fluorescence and other factors. The Power LED is the only diode that produces such a broad spectral output. 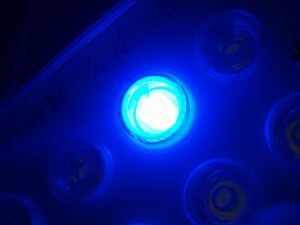 Not all light can be used by coral, and in fact, even lights that emit a very high PAR value can be completely useless for illuminating a reef aquarium. What must be considered is PUR (photosythetically usable radiation) for photosynthetic marine invertebrates. The PUR percentage of the PAR output is higher for the Power LED than it is for any other diode. Approximately 50% of the light energy output of a Cree XP-G or XR-G diode is wasted, as it doesn’t fall into the PUR range for photosynthetic marine invertebrates. (put in power led par ratio). What does this mean for your aquarium? It means more efficiency, less wasted energy and heat, improved coral health and growth, more coralline algae, less nuisance algae, and a greener footprint! In summary, our proprietary Power LED diode has no comparison. We heard the complaints of Cree and Luxeon users, and created an LED specifically for reef aquarists. Once you experience the Orphek Difference, you won’t look back!